The new Olsen370 is the latest creation of the original Olsen yachts. It’s the first version of an elegant Weekend-Cruiser, designed and build on the old yard in Stubbekøbing. ”All halyards and sheets from the mast will be lead to the stand-up blocks transverse to the mast, below coachroof in each side, through Spinlocks to the two winches mounted on the side deck direct in front of the helmsman. This will mean that no ropes are visible between mast and winches, and therefore the positions in front of the cockpit aren’t filled up with “hostile” ropes. The intentions with our new Olsen370 are basically the same but adjusted with the boat builders needs of today. The deep cockpit is equipped with a steering wheel from where all halyards and sheets can be managed. To ensure optimal steering position cockpit seats are made in such a way, that you can decide in which position to steer the boat. They can be folded away, if that’s what you want. The low coach roof makes it possible to have a brilliant view over the boat while sailing. In front of this position we have 2 cockpit lockers in a length of 2 meters. 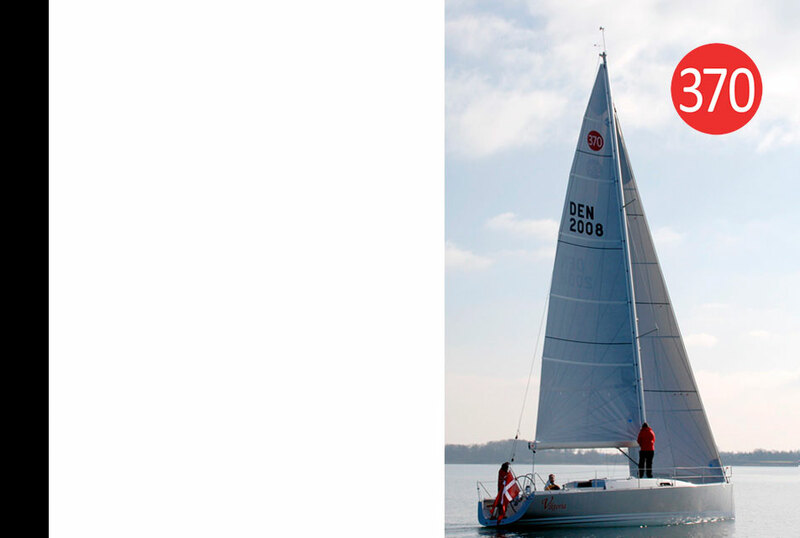 The top part can be folded inwards to form a sun bathing platform (2 x 1.6 meters), which can be used while sailing. Both cockpit lockers are so spacey, that sails can be stored together with 2 bikes and 2 golf bags. Below deck we have made everything looking as bright and open as possible. The centre section of the coach roof is made out of smoked acrylic, and 3 elements can be open to ensure ventilation and emergency exit. The interior is made out of white pigmented oak, Corean™, frozen acrylic, white sprayed panels and light teak floor thought as a contrast to the dark blue cushions. The interior plan is more or less traditional, but elements are different. The top part of the toilet/bathroom is made out of frozen acrylic, which allows diffuse light penetration, but enough cover to obtain privacy. The traditional mast bulkhead is replaced by a frame and an extra stiff deck construction. To separate the salon and the berth in the front a low drawer has been fitted. On each leaf 2 Holmegaard glass lamps incl. Dimmer has been fitted. The two sofas have back rests, which goes around the corner to ensure optimal sit comfort. The two sofas can be used as extra berth by pulling them 15 cm out towards centerline. Lockers below side deck has been fitted from mast to aft coach roof. A specific design theme has been to ensure a low freeboard. To allow headroom below coach roof in harbour, the coach roof can be lifted approx. 20 cm electrically by pushing a bottom. OlsenYacht ApS is owned 50/50 by Peter Bjørn Olsen and Lars Hallkvist – an old sailing friend. Lars has been working with epoxy as a salesman the last 20 years mainly within turbine blades and boats. We have therefore decided to make the Olsen370 with the latest infusion technology. Epoxy has been selected as the primary resin system due to strength and ductility and to avoid osmosis. To see all these details in real life pls. give us a call here on the yard in Stubbekøbing.